A few days ago I wrote about my love affair with shrimp and grits, which is one of my favorite decadent comfort foods. But sometimes you want comfort food that is not only good for the soul but also good for the waistline, and that is where this recipe for salmon with brown butter sauce comes in. Yes, there is butter, but a reasonable amount, and it is combined with tangy salty capers and best of all, cooked slowly until it is brown butter. If you haven’t ever had the deliciousness that is brown butter (and more on that later), this is a great way to start, because we are going to drizzle it over a lovely, tender pile of flaked salmon, and whatever is getting you down is going to feel a little bit better. For example, some members of our particular family STILL don’t seem to be over the fact that meals now appear an hour late, due to the whole “fall back” thing. No, we are still not over it. 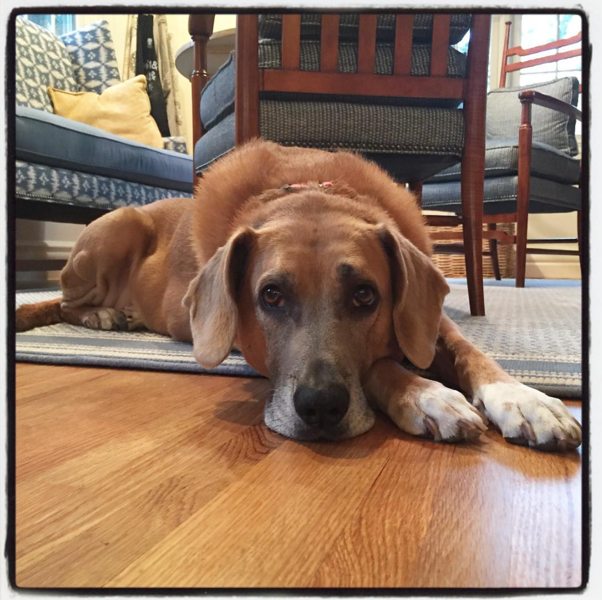 We still keep walking over to our supper dish at 5:30-really-6:30 and giving the humans pointed and doleful looks. Whatever your issue is, I promise that brown butter will make it better. Once you know how to make brown butter (which is very easy, I promise) you can use it for all kinds of things. Brown butter is made by melting and stirring regular old butter over medium heat until it foams and then starts to turn, yep, brown. That is the milk solids in the butter toasting up and giving the butter this rich, nutty flavor that is wonderful in so many ways. In this case, we are going to stir in some capers and use it as a sauce for a salmon filet that we have roasted and flaked into perfect little pieces. As you can see, I served my brown butter salmon over a nice pile of mashed potatoes, but you could also have over polenta, rice, asparagus, spinach…pretty much anything that would make a nice bed for the salmon. 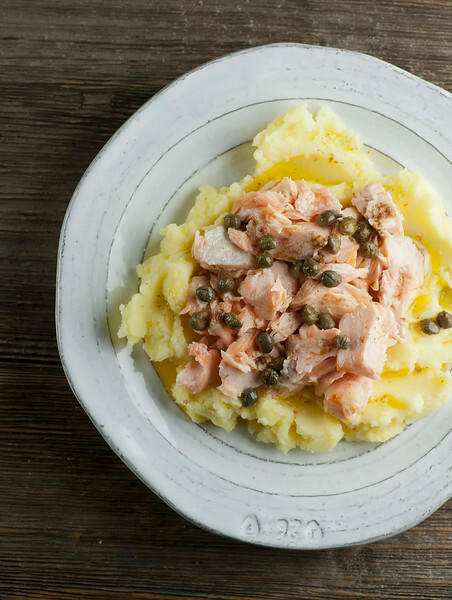 The math works out to just about a tablespoon of butter sauce per person, so between that and the good and good for you salmon, this is some delicious, nutritious comfort food that can be ready in less than 30 minutes. We feel better already, right? Preheat over to 450. Line a rimmed baking sheet with foil and place the salmon filet on it, tucking the narrow end underneath. Brush with olive oil, sprinkle with salt and pepper and roast for 15 minutes. Remove from the oven and using two forks, pull the salmon meat into bite sized pieces. While the salmon is roasting, make the brown butter sauce: place the butter in a small saucepan over medium heat. Melt and cook until the butter starts to foam. Then stir gently until the butter turns a light brown color – watch carefully as this happens quickly! Stir capers and a pinch of pepper into the butter. 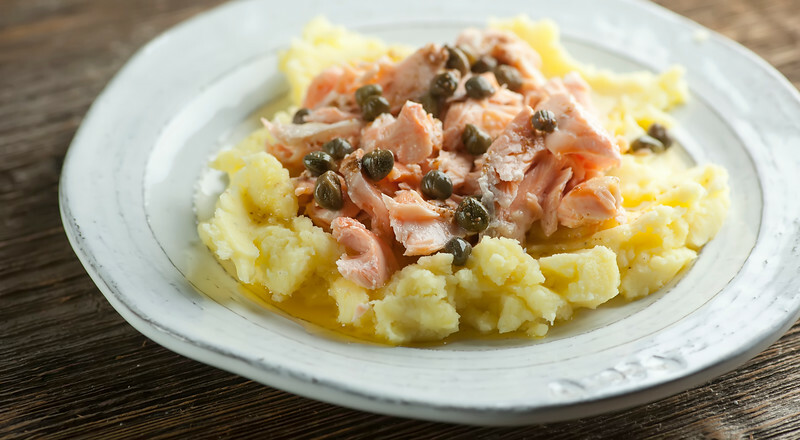 Place the flaked salmon on a plate, either by itself or over potatoes, polenta or veggies. Drizzle the butter sauce on top and serve. Aww your dog is the cutest! And this salmon looks delicious! I love the use of brown butter sauce in here. What a perfect dinner! Okay, salmon is one of my super favorites. I seriously eat it at least three times a week. And I never thought of putting brown butter in there. Brilliant, Kate! Me too!! Good and good for you, and so easy to roast up!